I’m sure you’ve seen it in a movie, or on the news. The scene is this: Some country breaks the demilitarized zone with an aircraft or a person. The other country interprets this as an act of war and promptly opens fire, destroying it before it has a chance to hurt them. You don’t step foot into the DMZ unless you’re wanting to die, or start an all-out war. Unfortunately, many marriages are setup like warring countries. There are tragedies, hurts, betrayals, and offenses that have gone unresolved. These stories become the DMZ between the couple. As one woman said in my office last week, “he had an affair 8 years ago, we never talked about it then, and we’re not going to talk about it now.” When a topic becomes off-limits, a DMZ is established. The bottom line is this: Marriages will not survive DMZ’s. The moment a story is placed in the “off limits” category, knowingly or unknowingly, the couple has declared war on intimacy, trust, and forgiveness — all components of thriving relationships. 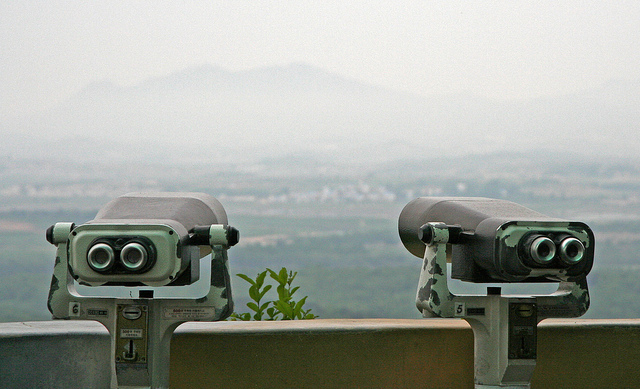 When a DMZ is established, the individual parties begin looking out for the best interest of themselves, and only look at the other person from a distance. So, how do countries stabilize war and DMZ’s? I’m not all that studied on international diplomacy, but I am with relationships. Ultimately it comes down to one goal: Peace. Enemies must make peace with one another for war to end. They do so by meeting in a neutral setting, being willing to make concessions, offer gifts, and accept a truce. Here’s how you start this process in marriage. – Take your shoes off, I’m serious. Ground yourself. The DMZ in your marriage is holy ground. It’s where blood has been spilled, death has been seen, and hope has been lost. We bring silence and respect when entering a place of mourning. Taking your shoes off puts your feet in bare contact with the physical ground, and terrain. You’re more sensitive to what you’re walking on without your shoes. – Drop your weapons. You don’t walk into a peace treaty meeting with a machine gun. What are the weapons you use in marriage? Contempt? Stonewalling? Name calling? “Calling it like you see it”? Avoidance? Manipulation? Control? Rage? Silence? Regardless of the weapon you love to brandish, leave it at the door. Tell your spouse what it is that you’re leaving behind. – Unfold your arms. Our body language tells others everything they need to know to make a judgement about how we’re approaching the situation. This happens instantly, unconsciously. By crossing your arms or legs, you’re signaling defensiveness and being closed off. Defensiveness will keep DMZ’s alive, not a way to make peace. – Listen twice, speak once. The reality is most of us do not listen very well. We’re generally more interested in forming our rebuttal than allowing the words, emotions, and energy to get to us. Before you respond with what you want to say, reflect back to the other person the actual words they spoke and ask if you heard everything correctly (ie- “I heard you say you feel like I don’t like you, and that I care more about work than I care about you, is that right?). – Slow down, breathe. Take deep breaths to slow down your heart rate. This decreases the chances of your fight or flight response from taking over. Relax your jaw, your fists, and breath. It may sound hokey, but slowing your heart rate will better allow you to view the other person as a friend, not a foe. – Listen to your senses. What do you smell, see, and feel (physically)? In fights or places of tension, we are generally being reactive to something from the past (see #4 – fight/flight). Practicing awareness of our senses brings us into the present moment, and helps to bring clarity. – Practice offering gratitude. If you’re not offering thanks to your spouse for their efforts to bring peace, peace will not come. Be wary of how entitlement cheats gratitude (“she should know better…”, or “I shouldn’t have to tell you this…”). If you can’t find something to be thankful for, the issue is with you, not the other person. The saying is true: “It takes two to tango,” but it only takes one person to change the way they are dancing to invite the other to do the same. I’ve seen it dozens of times where one person has offered peace to an unwilling and defensive participant, and it changes the relationship. Don’t wait for the other person to change first, they are likely waiting for the same thing.